On Gallery Hopper, Todd Walker points to an award winning anti-smoking campaign that uses Robert Polidari's Katrina photos to make a visual metaphor to the body of a smoker. As Todd mentions, the whole idea of tragedy as art is off-putting to begin with, but this campaign takes it down a rung on the good taste-ladder. The effectiveness of this campaign relies on the target audiences' lack of knowledge about the origin of the photos. They are merely photos of dirty and upturned homes, not controversial images from ground zero of the greatest natural disaster in the history of the US. 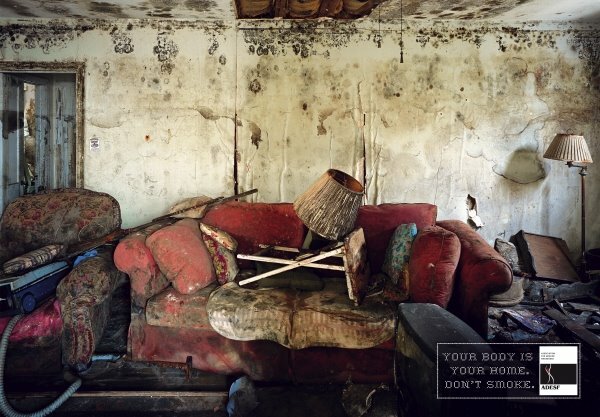 In making the choice to compare the flood ravaged homes of the working poor to the body of smokers, the creatives made the choice to negate the experience of the individual homeowners and all the residents of the Gulf Coast affected by Katrina. Don't get me wrong. Cigarettes are a major public health problem and I am a fan of innovative campaigns that manage to break through the clutter to address individual use and expose the evil nature of the industry. But, this campaign trades a disaster for a problem and in the process manages to devalue both. Am I overreacting or does this rub you the wrong way, too?